Tex Malinson: You're layin' it on kinda thick ain't you, professor? Them are pretty big letters... do you think I can live up to all that? Professor McGill: A mere bagatelle, my boy. With myself as impresario, your success is assured. Claude 'Grass' Hopper: Them's mighty big words, Professor, but you know Tex, he's a cowhand. He ain't no actor. Professor McGill: My good man, I am a thespian. To one who has trodden the boards with the immortal Booth, nothing is impossible. Per his M.O., one of the reviewers of this film fills the site with yet more of his incorrect, at best, assumptions and mis-statements. 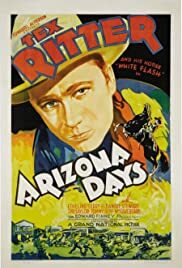 This one starts with his usual assertions that Grand National Pictures signed Tex Ritter to a contract to make a series of films produced by Grand National. Other than about four films (including two James Cagney films), Grand National was primarily a distribution company for the films of about a half-dozen independent producers. He also incorrectly states that...."they (Grand National) signed Tex Ritter from The Grand Old Opry (sic) as their singing cowboy. No, Bucky, Tex Ritter had never appeared on The Grand Ole Opry until after his singing-cowboy career was over. Tex Ritter, then working, on a radio station in New York City, was SIGNED to a film contract by producer Edward Finney, who, in turn, then signed a contract, with Grand National Pictures, to produce a series of westerns for Grand National distribution---GN did not produce any of the westerns that were distributed under the GN logo. And, by the way, quoting Booda-do---"As a studio Grand National Pictures only lasted for a couple of years..."; the last time I looked, a couple meant two...and the last time I looked, Grand National distributed films made by independent producers (in addition to actually producing two Cagney films)for over five years...which is a couple doubled plus one. The reviewer who included the clap-trap misinformation in his review has been contacted by private message(s), over the past couple of years, regarding his error-statements,(on six of the ten reviews this contributor has read by this reviewing assumer) in which it was suggested that he might care to edit his review(s) and delete the highly-fabricated statements he made, but he seems to resent, rather than appreciate someone trying to help him not look foolish. Other than his opinion of the film(s) he writes about, his knowledge of vintage films seems to be somewhat, at best, lacking.